Kenmore dentist and her team earn consecutive Spectrum Awards for outstanding customer satisfaction. 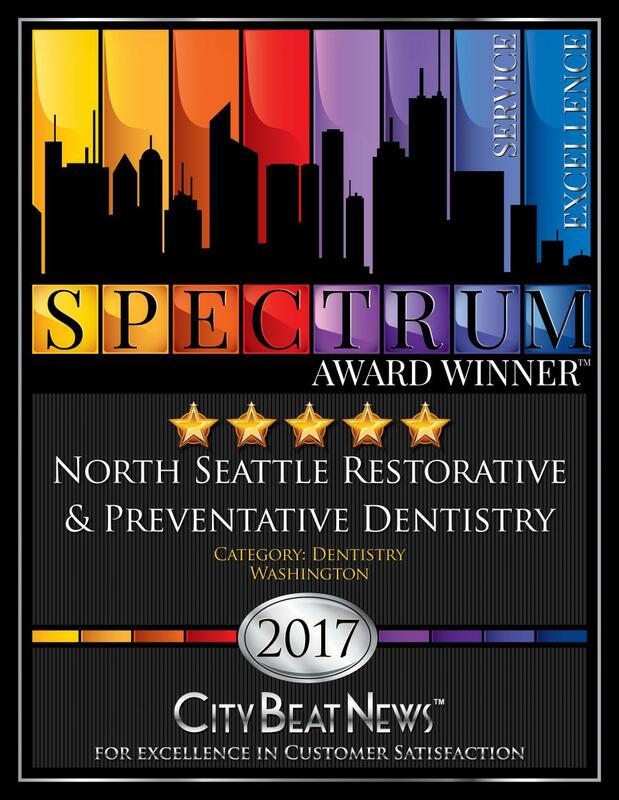 KENMORE, WASHINGTON, UNITED STATES, December 6, 2018 /EINPresswire.com/ -- Offering a full spectrum of dental services with a heart for patient satisfaction, the team at North Seattle Restorative & Preventative Dentistry has brought home a second straight City Beat News Spectrum Award for Customer Satisfaction. Winners of the Spectrum Award are based on City Beat News’ independent, proprietary research and evaluation system, which identifies businesses and professionals with a track record of top-flight customer service. The rating system combines data collected from nominations, online and other customer reviews, surveys, blogs, social networks, business-rating services, and other honors and accolades — all of which express the voice of the customer. Those that earn a 4-star or 5-star rating receive the Spectrum Award. North Seattle Restorative & Preventative Dentistry provides affordable, cutting-edge dentistry known throughout the Northwest for its superior quality. Above all else, the practice is dedicated to its patients’ dental health and satisfaction. Dr. Emerson also credits her staff with leaving patients satisfied. Each member of her supporting team was hired for their high level of training and capabilities. Together, they share the central goals of educating and providing excellent, comprehensive dental care for every patient depending on their individual needs. The team also includes three local labs that Dr. Emerson selected for their excellence in making prosthodontic products such as dental veneers, crowns, partial dentures and implants. “Through experienced planning, meticulous craftsmanship and superior in-office support systems, we offer one of the most superior dental experiences available in the areas of North Seattle, South Everett, Eastside and Kenmore,” says Dr. Emerson. North Seattle Restorative & Preventative Dentistry is located at 5701 Bothell Way NE #6 in Kenmore, Wash. For more information, call 425-486-2715 or go online to www.emersondds.com. Visit the practice’s Award Page at https://awards.citybeatnews.com/JENNIFER-S-EMERSON-DDS-PLLC-KENMORE-WA.